Go ahead and admit it, you want to be the owner of the most stylish bike on the block. 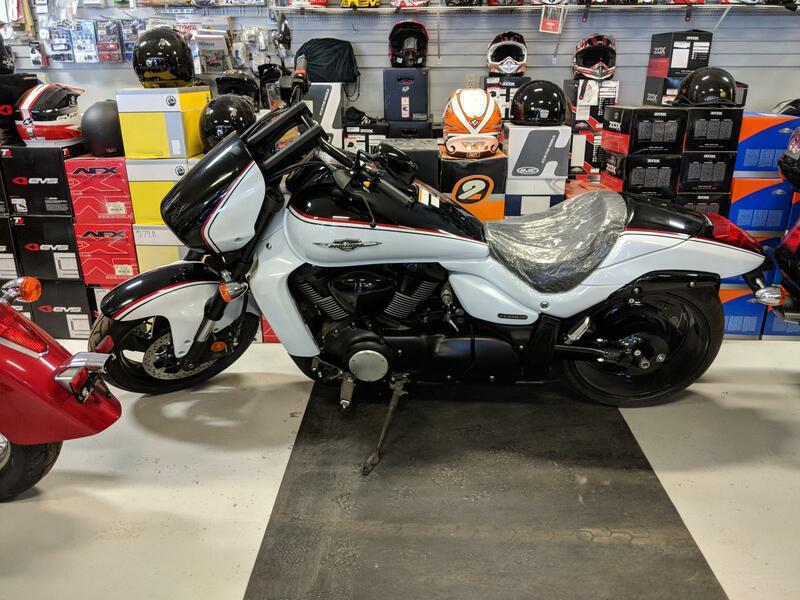 Lucky for you, the Suzuki Boulevard M109R B.O.S.S. grabs attention everywhere it goes. An incomparable black color scheme coupled with aggressive styling scream in testament to the M109R’s power. If looks aren’t enough to sell you on this bike, then let the 1783cc V-Twin engine convince you. Tuned to produce massive torque from idle to red-line, the 2015 Suzuki Boulevard M109R B.O.S.S. will keep you smiling and styling through your journeys to come. Without question, the M109R B.O.S.S. delivers unparalleled performance and gorgeous styling to own the night. The M109R B.O.S.S. features an advanced chassis built for effortless cruising across town, or across state lines. Its unrivaled capabilities are born from Suzuki's championship-winning race heritage. The M109R’s engine is tuned to produce massive torque all the way from idle to redline, which translates into acceleration that you have to feel to believe. The big V-twin also produces a throaty, aggressive exhaust that identifies the M109R B.O.S.S. as a power cruiser beyond compare. The M109R B.O.S.S. has the following features blacked out: 1. Rearview mirrors, 2. Handlebars 3. Clutch lever 4. Brake lever 5. Handle switches 6. Front fork outer tubes 7. Steering stem head 8. Tank cover 9. Air cleaner cap 10. Clutch cover 11. Magneto cover 12. Cylinder head covers 13. Side covers 14. Final gear case 15. Mufflers 16. Front and rear brake calipers 17. Prop stand. A 1783cc, 8-valve DOHC, 54-degree, liquid-cooled, V-Twin engine is designed to produce a massive tractable power and responsive torque. Huge 112mm (4.4 in) forged aluminum-alloy pistons. One of the largest reciprocating gasoline engine pistons being used in any production passenger car or motorcycle. The 2-into-1-into-2 stainless steel chromed exhaust system features Suzuki's digitally controlled SET (Suzuki Exhaust Tuning) system for optimum engine performance and a powerful V-Twin sound. Each engine bore is lined with Suzuki's race proven SCEM (Suzuki Composite Electrochemical Material) for optimum heat transfer, tighter piston-to-cylinder clearances and reduced weight. A dual spark plug per cylinder ignition system is controlled by the Boulevard M109R's powerful 32-bit ECM for improved combustion efficiency and reduced exhaust emissions. A unique two-stage cam drive system creates a compact cylinder head design, reduces overall engine height and creates a lower center of gravity. A high-tensile double cradle steel frame is built to comfortably handle all the power and torque while delivering agile handling and a plush, smooth ride. Inverted front forks feature race-proven cartridge internals with 46mm stanchion tubes and provide 5.1-inches of wheel travel. A cast aluminum alloy swingarm works with a progressive shock linkage and a preload-adjustable single rear shock delivering 4.6 inches of wheel travel. The widest 240/40R18M/C 79V tubeless rear tire ever used on a SUZUKI motorcycle. Instrument cluster including a digital tachometer, gear position indicator and LED indicator lights is integrated into the top of the headlight cowl. Tank-mounted analog speedometer and LCD odometer, dual tripmeters, fuel gauge and clock. Warranty: 12 month unlimited mileage limited warranty.